I'm not usually in the room when Darya wakes up in the morning, so there's something precious about experiencing those first few moments with her when we travel. On this day, already long awake, I grabbed my camera to record that groggy look. It probably ruined the moment, but when I look at it I remember all the other lazy mornings we spent waking up together in a hotel room. Lívia on October 20, 2011 at 12:44 p.m.
Oh, God! It's delicious when we travel with our kids!!! tourist hostel on October 20, 2011 at 1:10 p.m.
fany fernandez on October 20, 2011 at 3:29 p.m.
cute girl ! ... but a mess room. Lisa on October 20, 2011 at 6:35 p.m. I have seen that very same look when my kids get tired of me pointing a camera at them! Debbie on October 20, 2011 at 8:56 p.m.
Mara on October 21, 2011 at 4:45 a.m. So sweet. And has special resonance for me this morning Debbie - that's kind of what I look like right now! Henry Williams on October 21, 2011 at 1:01 p.m.
Terumi on October 21, 2011 at 2:54 p.m. I think mornings with kids is one of those things you keep with you forever and it's very cool you got a picture. Azeem @ Travel Tamed on October 23, 2011 at 2:56 a.m. Awesome capture. 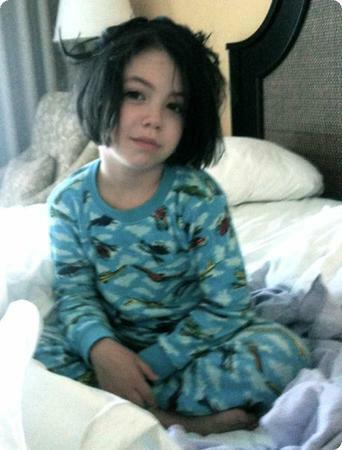 Kids look so pretty when they wake up with sleepy mood. Very nice. Keep up the great work.